Drawing on an analysis of issues surrounding the consumption of alcohol in a diverse range of source materials, including novels, newspapers, medical texts, and archival records, this lively and engaging interdisciplinary study explores sociocultural nation-building processes in Mexico between 1810 and 1910. 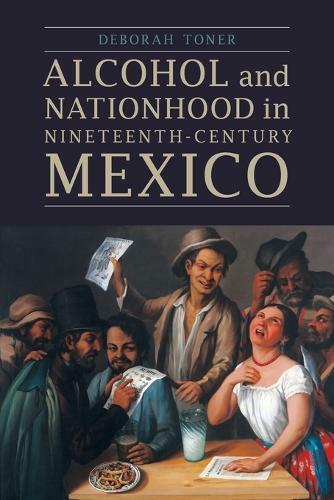 Examining the historical importance of drinking as both an important feature of Mexican social life and a persistent source of concern for Mexican intellectuals and politicians, Deborah Toner's Alcohol and Nationhood in Nineteenth-Century Mexico offers surprising insights into how the nation was constructed and deconstructed in the nineteenth century. Although Mexican intellectuals did indeed condemn the physically and morally debilitating aspects of excessive alcohol consumption and worried that particularly Mexican drinks and drinking places were preventing Mexico's progress as a nation, they also identified more culturally valuable aspects of Mexican drinking cultures that ought to be celebrated as part of an "authentic" Mexican national culture. The intertwined literary and historical analysis in this study illustrates how wide-ranging the connections were between ideas about drinking, poverty, crime, insanity, citizenship, patriotism, gender, sexuality, race, and ethnicity in the nineteenth century, and the book makes timely and important contributions to the fields of Latin American literature, alcohol studies, and the social and cultural history of nation-building.